Tuesday's events at Westminster's Portcullis House, which saw one Jonathan May-Bowles (aka Jonnie Marbles) launch a foam pie towards a weary-looking Rupert Murdoch, appear to have worked in the media tycoon's favour. Carey worked at News Corp from 1988 until 2002. He then took the US satellite company Direct TV into profit. Rejoined News Corp in July 2009, so not part of a team that paid $580 million for MySpace (sold for $35m). Carey is seen as "one of the guys" but a tough businessman and negotiator. His $26m pay packet in 2010 was cited in an investor lawsuit claiming Murdoch was unable to assert independent judgment. 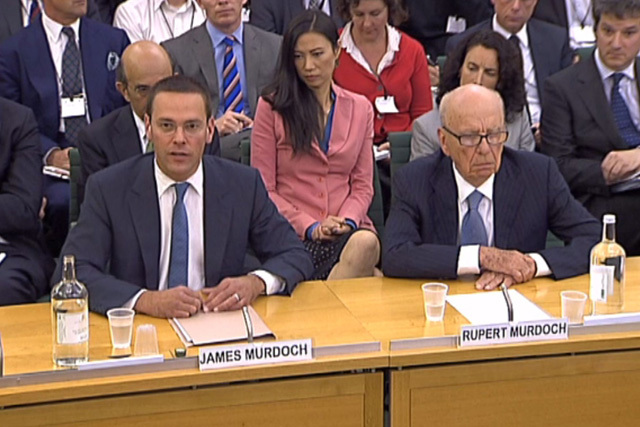 A well-orchestrated performance from Rupert and son James, who faced scrutiny from the Culture, Media and Sport Select Committee, went some way to reassure advertisers and city analysts worried about the fall-out from the phone-hacking scandal. Many observers identified Tuesday as the best day for the Murdochs since they closed News of the World and ditched News Corporation's bid for BSkyB. The City seemed to agree, with the share price of BSkyB, where James remains as chairman, rising from 714p early on Tuesday to 744p on Wednesday afternoon. Earlier in the week, Rupert wrote to around 60 advertisers to apologise and to "reassure you that we are taking concrete steps to resolve these issues". The Murdochs said they had "no immediate plans" to launch a Sunday version of The Sun, but are expected to move quickly as rivals the Sunday Mirror and the Daily Star Sunday both increased circulation in the absence of News of the World. Before the Murdochs' evidence on Tuesday, the company's handling of the crisis was criticised by some, leading to speculation that Chase Carey, the chief operating officer and deputy chairman, could replace Rupert as the chief executive of News Corp.
ARE ADVERTISERS BEHIND THE MURDOCHS? "The City view is that the Murdochs acquitted themselves well under the circumstances – especially Mrs Murdoch's fast and fearless actions! But they have questions to answer. Corporate governance, corporate governance, corporate governance." "NI has avoided disaster by showing real gravitas thanks to a strong performance from James Murdoch. It also managed to garner a surprising amount of sympathy towards Rupert Murdoch. However, none of the long-term worries have yet to be addressed." "Our clients have been quite supportive. There have been lots of allegations – and that's exactly what they are, allegations. It was down to our clients' moral judgments, but we advised that this could be commonplace with other newspapers. Our clients haven't pulled out but have had a watching period." "It feels like every day there's a new twist and turn, so no-one is committing themselves long-term or even mid-term. I don't believe that The Sun has suffered yet, but we saw how quickly sentiment changed for News of the World, so they would be unwise to take the business for granted." "It was good to have them both there and it will probably have an impact on advertiser sentiment. Support, whether tacit or active, will continue for advertisers. The critical question will be with readers. If readers start to feel more confident, then that will be important." "Clients are being advised to wait until the outcome of the criminal investigation and then act accordingly. The Murdochs defended their business as you would expect them to do and they expressed regret, as you would expect. So it was a balanced performance."